Arts organisations located outside of London struggle to get their fair share of national press even before the news industry entered crisis mode. Now the latest round of belt tightening has seen travel budgets slashed and editorial cuts across the board. 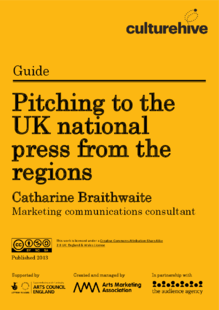 Don’t despair, says seasoned arts PR Catharine Braithwaite. With the right approach and some good planning, culture in the regions can still make the national pages. Experience at Manchester Art Gallery and Tate Liverpool gave Catherine the confidence to go freelance where she has been lucky enough to have clients as varied and high profile as Manchester International Festival, Tate, Liverpool Biennial, Manchester Museums Consortium and The Hepworth Wakefield. She has been Associate Lecturer in Marketing at University of Leicester’s School of Museum Studies since 2002 and is a Trustee of HOME, Manchester’s newest arts centre.